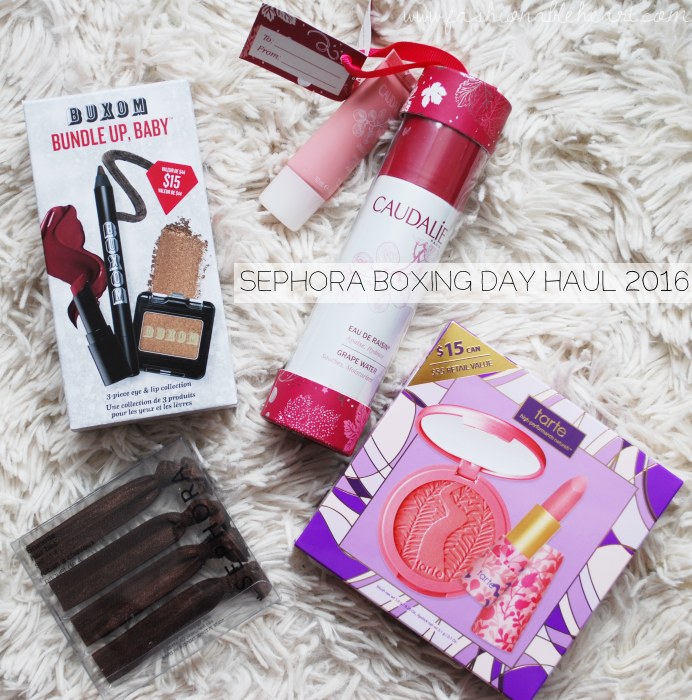 Sephora is one of the only Boxing Day sales that I took advantage of. The other one was with a clothing store to grab some new pants for my husband. I didn't go overboard, but I think I got some impressive deals. One set that I wanted (the Boscia kit) sold out between me adding it to my cart and checking out so thanks for saving me another $15, Sephora. Ha! 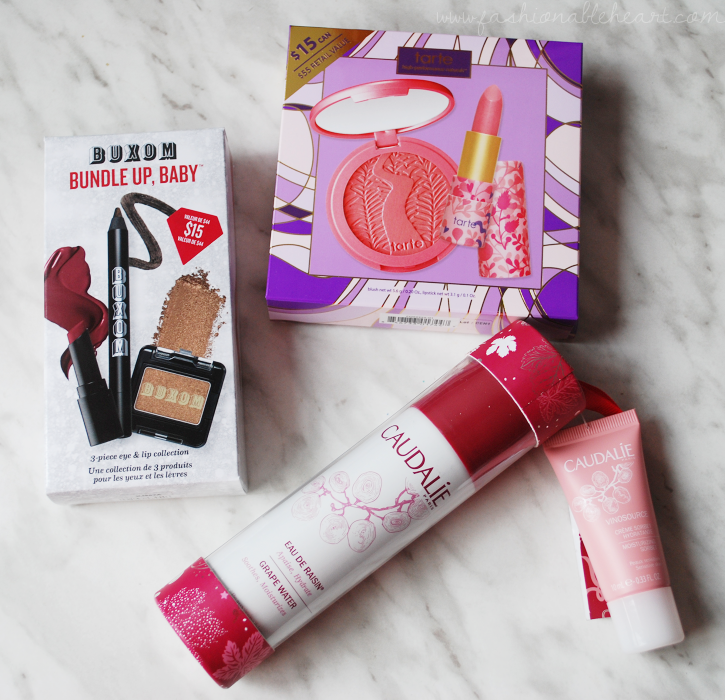 If you've never taken part in their Boxing Day sales, every deal offered is C$15. Some deals are better than others. I try to do my homework before they go live to know exactly what I am interested in and what is getting me more bang for my buck. So here are the three items I chose from the sale. I also grabbed another set of my favorite hair ribbons to bump up my order to free shipping. If you're here for swatches and reviews, don't fret. I'll have you covered in later posts. This is just sharing what each set offered and why I chose it. Buxom Bundle Up, Baby - Came with a full-sized eyeshadow and deluxe samples of a lipstick and eyeliner. I thought the taupe eyeshadow was gorgeous and the eyeshadow pan is removable from the case with the option to buy one of their 6 pan palettes to create your own. Or you can keep it single and ready to mingle. Caudalie Grapest Hydration Duo - Came with a Grape Water in limited edition packaging in the 2.5 oz size. I'm pretty sure this size is typically only available online. It also came with a small tube of their Vinosource Moisturizing Sorbet. I love facial sprays, so I thought this would be a good one to try. Plus, I'm like a moth to a flame anytime I hear the word "hydration". Tarte Pretty Posse - I personally think this was the HG of the deals offered. A full-sized blush and lipstick for $15?! They'd normally be around $55 for the pair. Heck to the yes. I love the Amazonian Clay blushes, which I have mentioned quite a few times. I had not tried this lipstick formula, though. I was easily the most excited about this and was surprised that it wasn't sold out when I checked the site later that day! As for samples, I had a code for a deluxe sample and went with the Laneige Water Sleeping Mask. 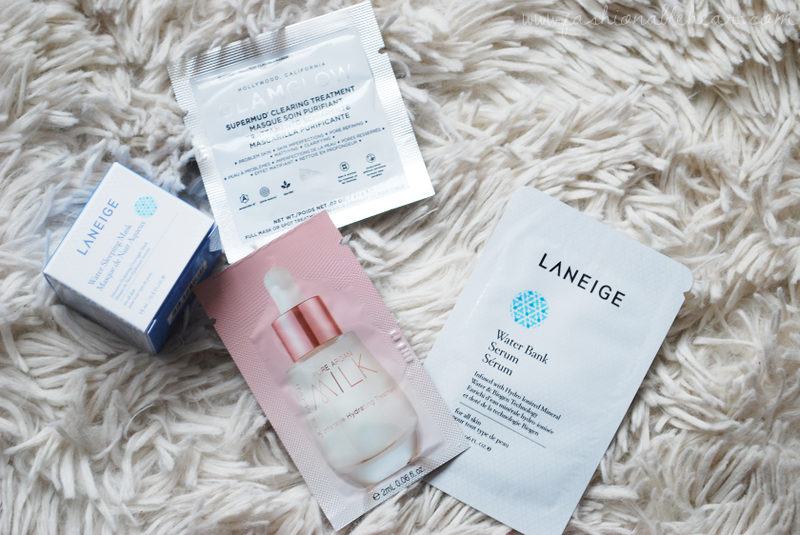 For my other generic three samples that come with each order, I chose a GLAMGLOW mud treatment, Laneige Water Bank Serum, and a Josie Maran Pure Argan Milk treatment. Looking forward to trying these! Did you pick up anything during the sale? And have you tried anything in this post?